Based on the Hawker 800, the Raytheon Hawker 1000 seats one less than the smaller Hawker 800 but has a longer range and one more window on each side of the cabin. In combination with a high speed, large baggage capacity, and an improved interior, with increased headroom and shoulder room, the Hawker 1000 is one of the most luxurious forms of travel available. After the success of the Hawker 800, Hawker 800A, and the Hawker 800XP, the British Aerospace Corporation announced the Hawker 1000 as the next installment of its HS-125 private business jet series. Based on the Hawker 800, the Hawker 1000 features two additional windows, a fuselage stretch, and an improved wing design. The Hawker 1000 strikes a balance in desired features and performance, debuting as a roomy midsize private business jet with intercontinental range capabilities. Production on the Hawker 1000 started in 1991 and ended in 1996. 40 aircraft have been built so far. The cabin of the Hawker 1000 measures 24.4 feet in length, reaches 5.8 feet in height, and stretches a maximum of 6.0 feet in width with a floor width of 4.4 feet. The cabin features a traditional or a biomorphic design. The biomorphic design features smooth curves, advertised to both increase useful space while improving passenger comfort. 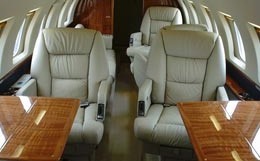 The cabin of the Hawker 1000 is typically configured to accommodate eight passengers, but can be arranged to seat nine. Fourteen windows surround the cabin, providing a light atmosphere for work or relaxation. 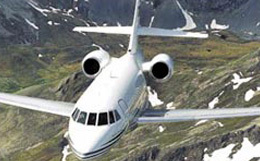 With a maximum cabin pressure differential of 8.6 psi, the Hawker 1000 is capable of maintaining a sea level cabin altitude at an altitude of 22,200 feet. The Hawker 1000 comes equipped with two Pratt & Whitney Canada PW305 turbofan engines. Each engine is rated at 5,255 pounds of thrust at take off. This newer engine design releases exhaust at a slower velocity, allowing for a reduced noise footprint. In addition to the new design, these engines come standard with a Full-Authority Digital Control (FADEC) system, which utilizes information from the air data system and throttles to configure the engines’ performance. With these engines, the Hawker 1000 requires 5,950 feet of runway to take off at sea level on a standard day. At an airport with an altitude of 5,000 feet, this take off requirement increases to 8,075 feet of runway. 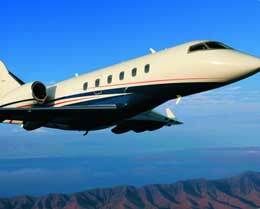 With four passengers, the Hawker 1000 needs only 2,500 feet of runway to land. This private business jet features a range of 3,098 nautical miles and a maximum certified service ceiling of 43,000 feet. In a long range cruise configuration, the Hawker 1000 is capable of maintaining an airspeed of 400 knots at an altitude of 41,000 feet. 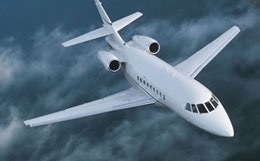 In a high speed cruise configuration, this private business jet is capable of maintaining an airspeed of 453 knots at an altitude of 37,000 feet. The avionics suite selected for the Hawker 1000 was the Honeywell SPX-8000 dual-channel fail-operational digital flight system. Incorporated into this system was the five EDZ-818 flat panel electronic flight instrument system (EFIS). Other instrumentation systems incorporated into this suite include a Primus 870 Doppler weather and turbulence system, the Bendix/King KHF transceiver, and the LSZ lightning sensor system. The FADEC system integrated in the engines allow for simplification of engine performance monitoring and adjustments, resulting in a more efficient engine with a more economical fuel burn while reducing pilot work load. 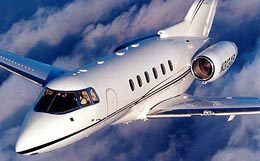 For more information about chartering, leasing or buying a Hawker 1000 please contact us by calling +44-20-3874-8091 or send us an email here.